A colourful history of aerial reconnaissance in the First World War, encompassing the development of early military aviation, the pilot aces, balloons, airships, observation spotters and how military tactics and communication systems evolved in tandem with aviation. After the first successful flight by the Wright brothers in 1903, the age of aviation was born, and by 1910 army commanders in the United States and Europe began ordering aircraft and experimenting with them. But at the outbreak of World War I in 1914, no-one could yet possibly know how significant a role they would play in the fighting. Aerial reconnaissance, observation and photography impacted the fighting in many ways, but little has been written about it. Balloons and airplanes regulated artillery fire, infantry liaison aircraft followed attacking troops and the retreats of defenders, aerial photographers aided operational planners and provided the data for perpetually updated maps, and naval airplanes, airships, and balloons acted as aerial sentinels in a complex anti-submarine warfare organization. Reconnaissance crews at the Battles of the Marne and Tannenberg averted disaster. The story told here involves the early American Lafayette Escadrille pilots who were looking for heroic deeds and romantic adventure in aerial combat, as well as the German, British and French aces of popular imagination. But the real value of military aviation lay elsewhere; balloonists, unsung heroes, were an essential part of the observation chain, and forever altered the nature of artillery operations. Observation spotters from planes further enhanced the benefit of being able to extend the target range well out of the line of sight and direct artillery fire, though communicating information was far from easy and systems from weighted message bags through light flashes, smoke signals and wireless messages were tried and honed. Eyes All Over the Sky fully explores all the aspects of aerial reconnaissance, and its previously under-appreciated significance. Also included are the individual experiences of British, American and German airmen; true pioneers of aviation warfare. The author has really done his homework, as evidenced by a 13-page bibliography, but the wealth of information provided is quite easily digested. With an interesting selection of photos, the book is not only an excellent reference - it is historically important. The book is a useful and affordable addition to the literature...makes an effective case for the value of the aerial gathering of intelligence. This is not only a good book, it's an important book...Much of the value of Eyes All Over the Sky comes from the fact that Streckfuss covers the entire air war—not just landplanes, but also naval aircraft and balloons. Including the latter provides an eye-opening perspective on what was really important to the nations that invested huge amounts of scarce resources to create their air services. This well-researched history belongs on the shelf of anyone with a serious interest in the air war or the ground war of 1914-1918. Jim Streckfuss' in-depth study of aerial reconnaissance is the product of thorough research in American, British, French and German archival and other sources, as attested by 51 pages of verification and clarification notes. This volume is well illustrated with black & white photos and maps, and is presented in an interesting and readable text. 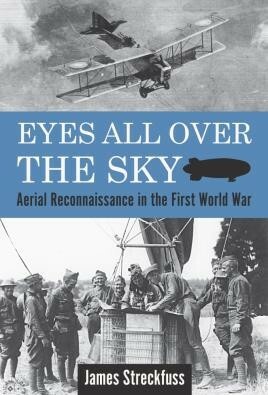 Eyes all over the Sky - Aerial Reconnaissance in the First World War is a fine book and recommended highly. This is a superb account of those early pioneers, the risks they took to secure vital information when the war was not yet in the air. An amazing book. This new book is a welcome addition and helps fill a historiographical gap in the literature about the war and our general understanding of the importance of airborne reconnaissance. I highly recommend it for the air power expert and novice alike.